Sounds just like a human mother I know! I clicked some random link today whilst checking out the news and came across a Discovery article that was pretty cool. The cuckoo is like the trailer park trash of the bird world. The girl gets knocked up and leaves the baby on another bird’s doorstep, only to turn around and get knocked up again. Screw it, let everyone else take care of them! Watching youngin’s takes up too much time – time that should be used to chainsmoke Camel Reds and buy more hot pants to strut around in. But really, imagine walking back into the room with some Biter Biscuits only to find that all of your children have been thrown out the window and there’s now an illegitimate child with a nicotine patch in their place screaming “FEED ME! FEEEEED ME!” – albeit with a convincing accent. Terrifying, if I may say so. 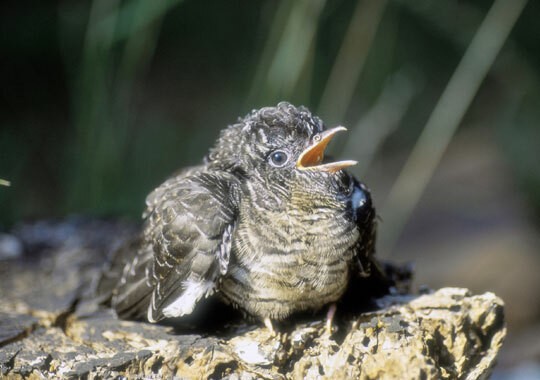 July 22, 2008 — The chicks of a species of Australian cuckoo can adjust their call in order to fool other species into rearing them, despite never having heard the cry, researchers have found. Like their European counterparts, Australian cuckoos are well known for laying their eggs in the nests of other birds. Once the chicks hatch, they kick out the host’s other eggs and set about convincing their foster parents to feed them by imitating the calls of the host’s offspring. But researchers from the Australian National University and the University of Cambridge, report in the latest issue of the journal Evolution, that one species of cuckoo can modify its call depending on which species it has hooked up with. Females of the Horsfield’s bronze-cuckoo (Chalcites basalis), usually lay their eggs in the nests of fairy-wrens, but will sometimes lay them in the nests of other species including thornbills and robins. Chicks that hatch in a fairy-wren nest are known to copy that species’ short “cheep cheep” begging call, while chicks that hatch in the nests of thornbills imitate the thornbill’s long, rasping whine. Very nice post on cuckoos! These birds and their brood parasitism are an interesting facet of bird life. Bad though these cuckoos may sound, some are even worse – they return to the hosts nest to check if their egg/chick is safe. If not they completely destroy the host bird’s nest. This phenomenon is termed as “Mafia behaviour” and can be seen in a couple of European and American cuckoos.